An aid convoy of around 250 vehicles has been held at the Port of Dover after French authorities refused them entry to France. The coalition of British groups had been on its way to deliver aid to people living in the so-called 'jungle' refugee camp in Calais. The French authorities in Calais have defended their decision to prevent an aid convoy of about 200 vehicles leaving Dover on its way to enter France. The Pas-de-Calais authorities said they had issued the ban for various reasons including the potential for the convoy to "generate violent episodes"; and a lack of available police officers because of the current European football championships. They also said the numbers of vehicles involved could "facilitate the intrusion of migrants". "In these circumstances, the Prefect of Pas-de-Calais considered only the prohibition of any event is likely to effectively prevent public disorders that may occur. "Moreover, any convoy on roads and highways, from Great Britain to Calais to slow or block the flow and constituting a public event, is prohibited." 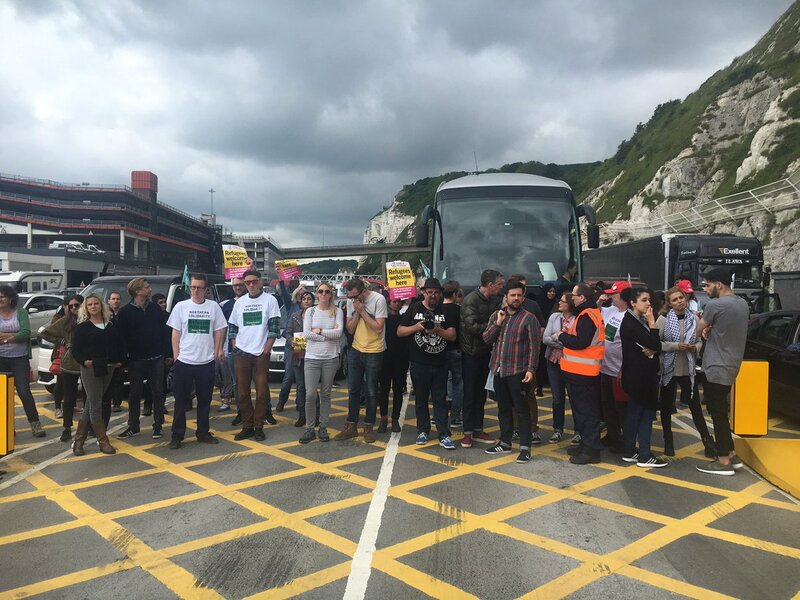 The Kent Police force has responded to complaints about an aid convoy being prevented from leaving the Port of Dover on its way to Calais in France. The convoy of more than 200 vehicles included teams from groups such as the Stop the War Coalition and the People's Assembly. They were carrying provisions and supplies for people living at the so-called 'jungle' refugee camp near Calais. Kent Police assisted the Port of Dover Police and French authorities after a convoy containing approximately 200 vehicles were denied entry to France on Saturday 18 June. The decision to refuse entry was made by the French authorities and no agency within the United Kingdom has any grounds to challenge this decision. The refusal of entry to France is a matter for the French authorities. Upon being refused entry to France, a demonstration took place at the Port. This started at approximately 1.50pm, which resulted in a brief closure of the border controls. Kent Police worked with partner agencies to ensure disruption was kept to a minimum and within approximately one hour the port resumed business as usual. A convoy of aid and supplies for migrants in the so-called Calais 'jungle' has been stopped at Dover. An aid convoy of around 250 vehicles has been held at the Port of Dover after French authorities refused them entry to France. 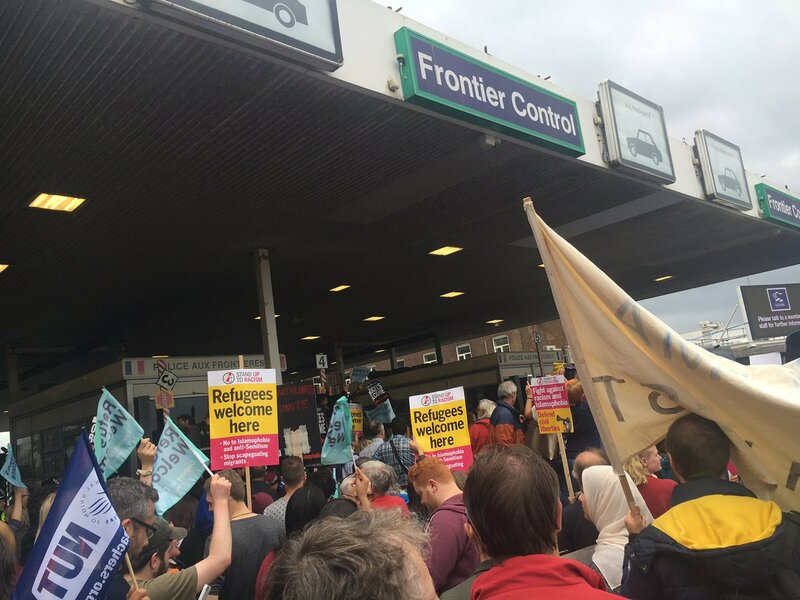 The Convoy to Calais is a coalition of various charities and groups who had planned to travel via ferry to deliver aid to the so-called 'jungle' refugee camp at Calais in France.